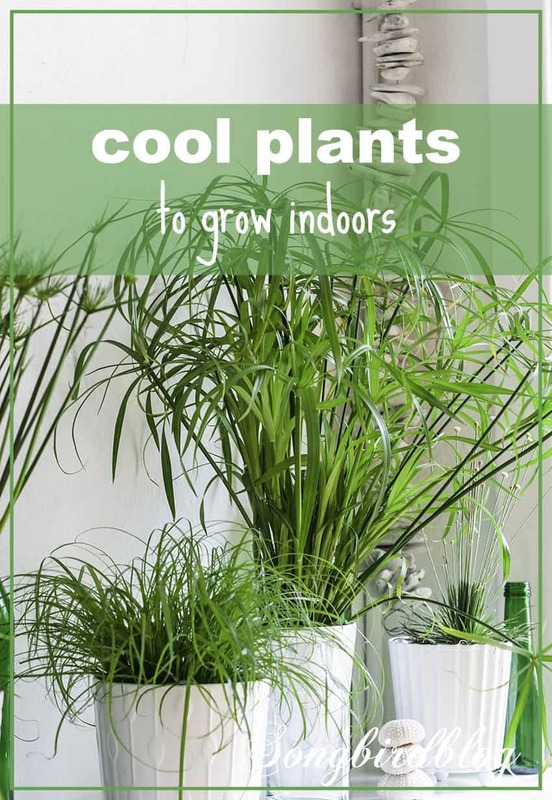 Cool plants to grow indoors. I love these easy plants to grow that are making an impression on this mantel. Wondering how to arrange indoor plants? Well just line up these easy to grow houseplants on your mantel for a big green wow effect. Today at the nest the color is green. As in green plants, as in decorating with easy to grow houseplants, as in green-is-my-Summer-to-Fall-decorating-color-on-my-mantel. Even though summer has only just begun in these parts, I was kind of ‘over’ my summer mantel. Not that I still didn’t like it, but I was in the mood for something new. Something to tie me over until I was ready to bring the Fall decorations out again. A trip to the garden center gave me all the inspiration I needed. I decided to go with green. Green plants. Now I must confess I am not the best keeper of plans. They tend to die on me. Either from neglect or from too much love. I needed dummy proof plants. ‘Cause I am a dummy when it comes to plants’. So I selected a collection of easy to grow houseplants that even I can keep alive. Well these grasses ticked all of those boxes. They are all variations on water loving grassy houseplants. From left to right your are seeing variations of Chlorophytum, and Papyrus plants. They need quite a bit of water, actually they need a lot of water. But you can’t really overwater them (they like wet feet), so just give them a big gulp once a week and they are fine. I love the texture all those spiky grass leaves have. I love the subtle variations in the green too. I think this mantel qualifies perfectly for an in-between-seasons-mantle and these lovely green plants really make my life beautiful and yet keep it simple and easy. Just my kind of decorating. This little one is my favorite. Those little round flowers look like tiny planets floating through the air. Mix it all up with some green bottles and you have a new and improved mantel decoration. Ha! Goed dat ik een post van je zie…Ik wilde je de hele dag al feliciteren…bij deze; Van harte gefiliciteerd met je verjaardag!!! Ik hoop dat j een hele fijne dag hebt en je lekker verwend wordt!!! Het was heerlijk. Onverwacht bezoek van mijn familie, lieve cadeautjes en prachtig weer. Wat wil je nog meer. Happy Birthday Marianne! I hope you have a wonderful day. I really like the green plants in the white containers. It makes a pretty combination. So refreshing. I love the idea of using grasses, Marianne. They are so striking against all the white in your home. Great idea! Thank you! I was quiet happily surprised by the effect the had myself. they seem to cool things down a bit too. Green is cooling. We’re having cooler temps this week– and we’ve had some rain, so things are greening up outside too. My house is so dark…everything I bring indoors- croaks. So far this year, everything I’ve tried to grow outdoors (with the exception of vegetables in fenced areas) has been trampled and eaten by the KILLER CHICKENS! Hugh that doesn’t sound good. Killer chickens sounds like a horror movie title. There are a few houseplants that do well in darker situations, but I must admit they are not necessarily the prettiest ones. Thanks for welcoming me back and leaving me your sweet comments. Marianne – I’m in love with all your plants!! I was looking for nice indoor plants as well and was wondering if you would know some of the plants names. I, too, am interested in the names of your plants. I love the subtle, clean, yet vibrant look of your mixture. Thanks much!